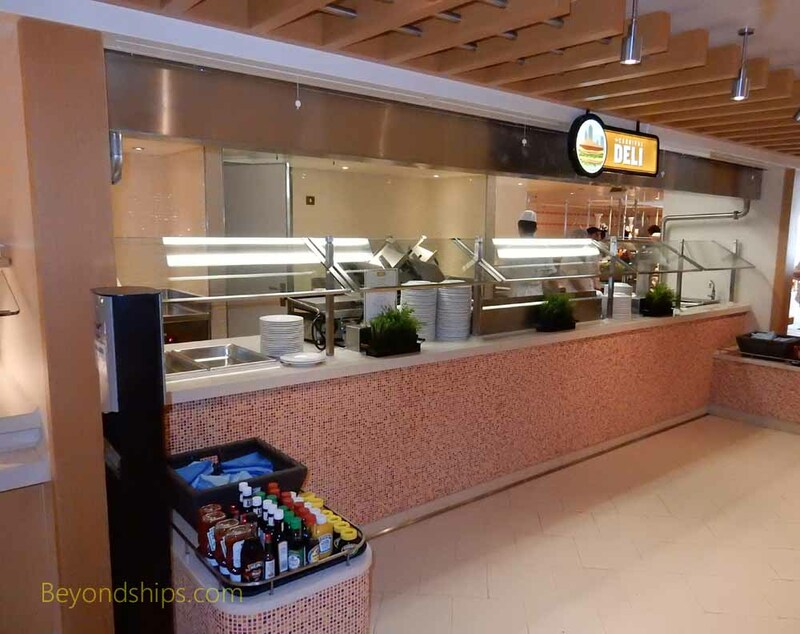 Carnival Vista provides a number of options for those times when you want a snack or a more informal meal. 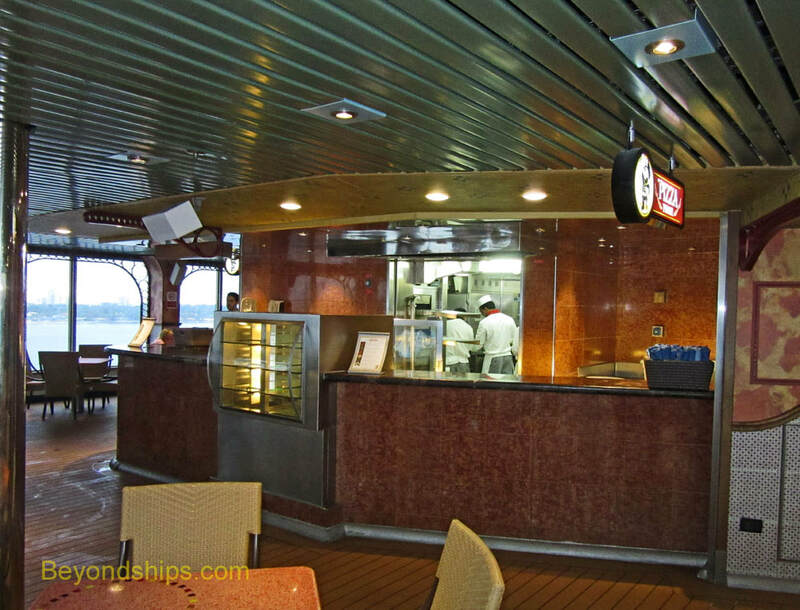 The Lido Marketplace is the ship's buffet restaurant. 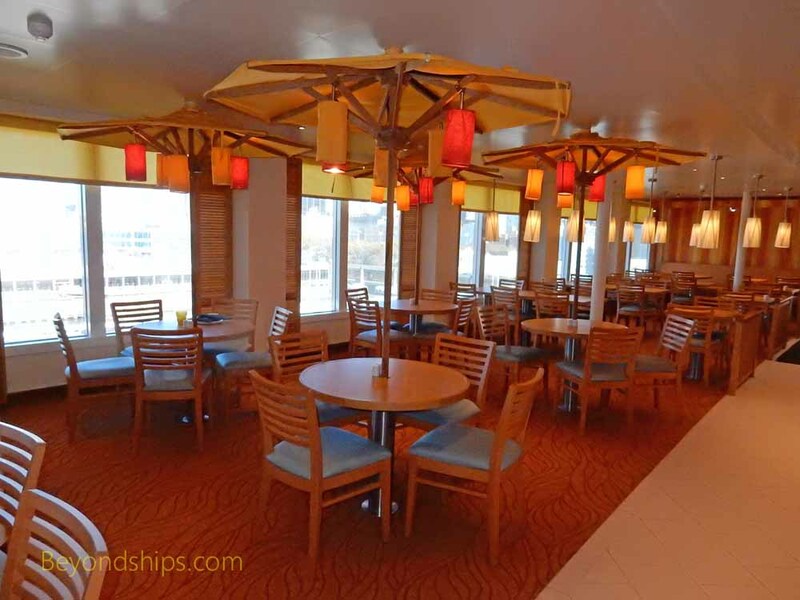 Located on Deck 10 between the main pool area and the aft pool area, it is convenient for guests using the pools and the open decks. 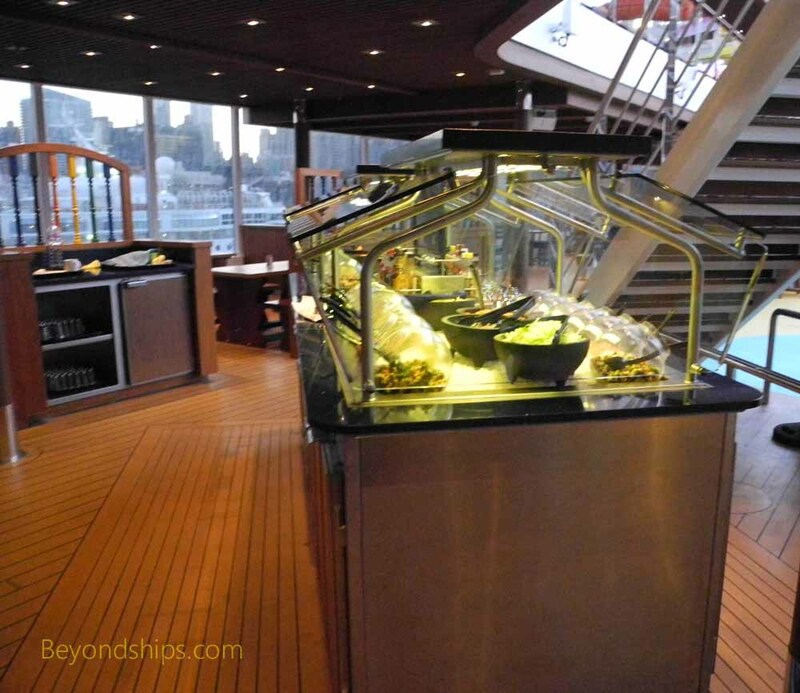 From its large windows, guests have panoramic views of the sea or the ports the ship is in. The windows also let in lost of natural light during the day. 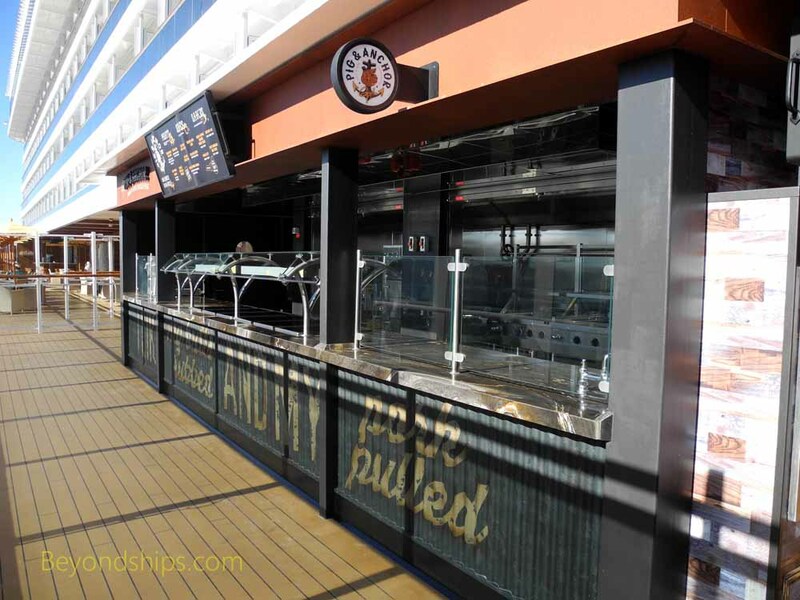 Above: Developed in partnership with celebrity chef Guy Fiere, Guy's Burger Joint offers some of the best burgers at sea. 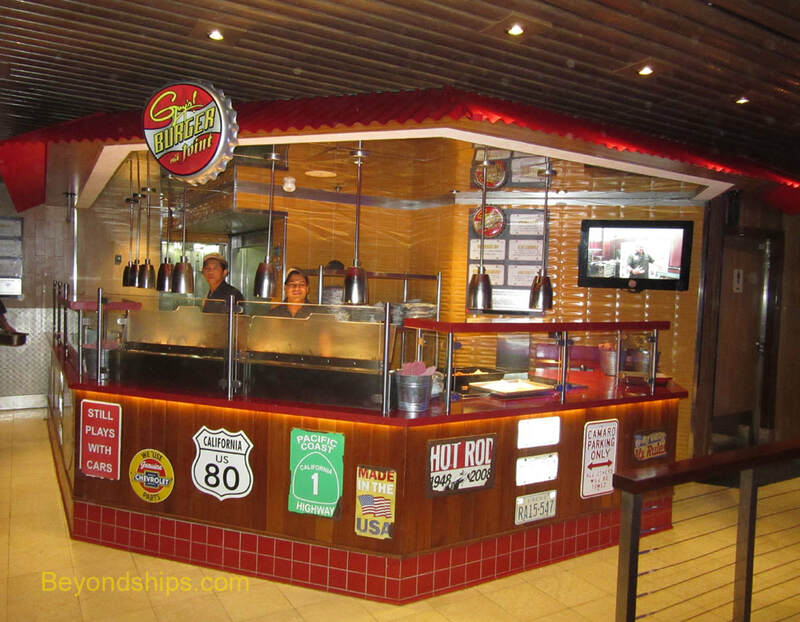 You can order them prepared according to Chef Guy's recipes or add your own toppings and sauces from the counter. When considering how many to have, beware that they are rather high in calories. 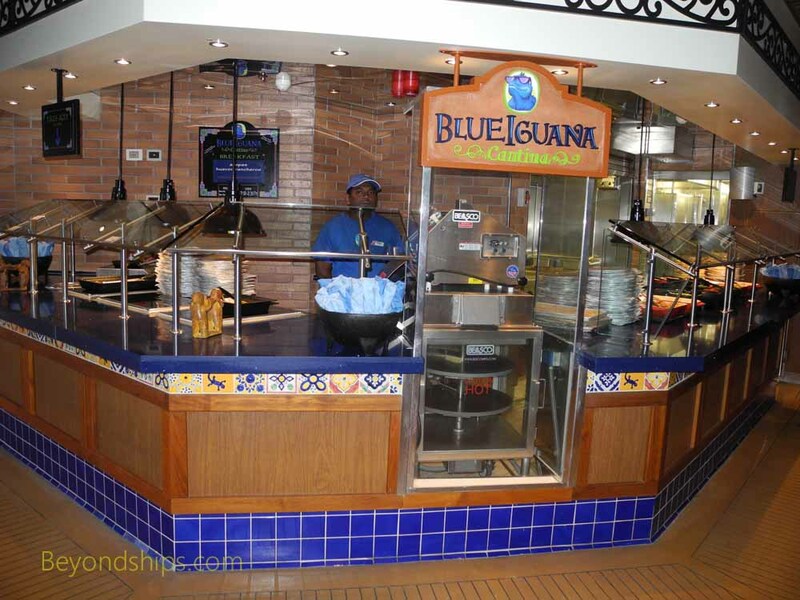 ​Below: Blue Iguana Cantina specializes in tacos and burritos. You tell the staff member what you want in your taco or burrioto and he or she prepares it in front of you. 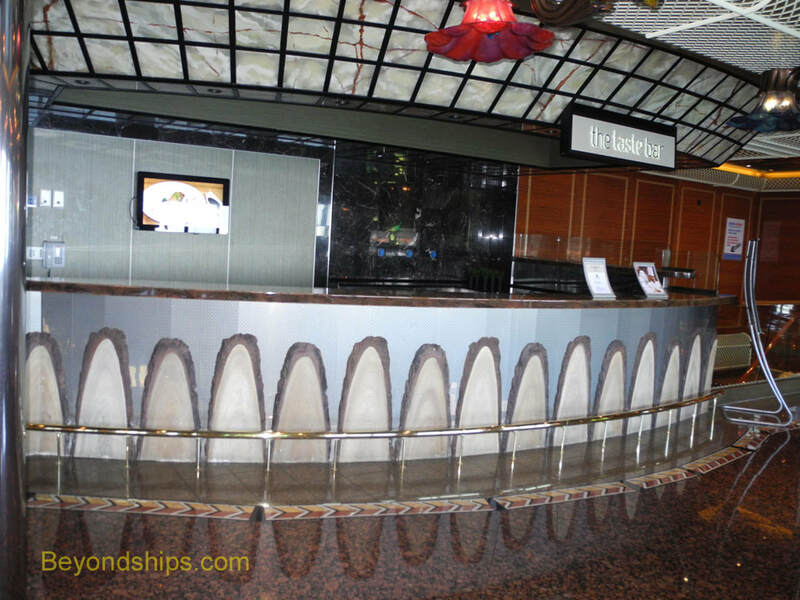 There is also an adjoining slsa and salad bar. This venue is open both for breakfast and lunch. ​The Pig and Anchor has barbeque items. 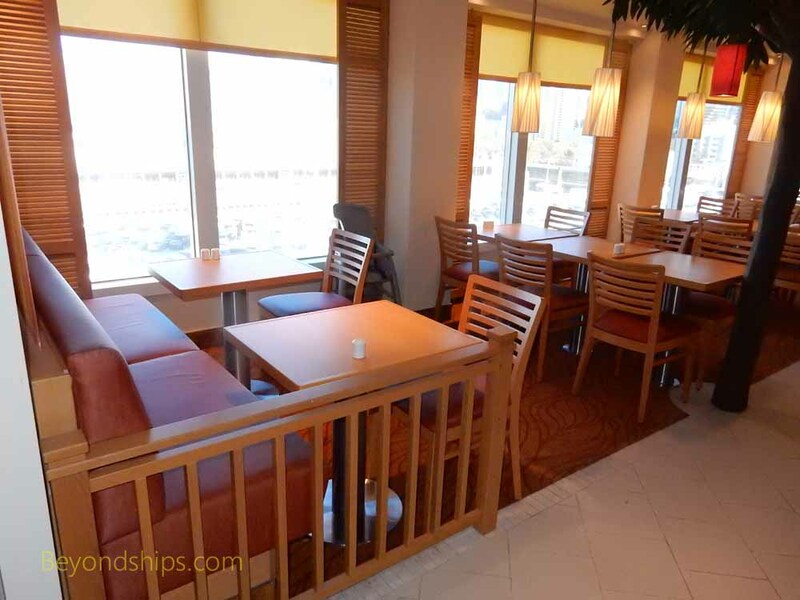 Because it is located outdoors on the Lanai, it is only open on sea days and in good weather. Left: Pizzeria del Capitano is Vista's pizzeria. It usually has four types of pizza, all based on a thin-crust model. 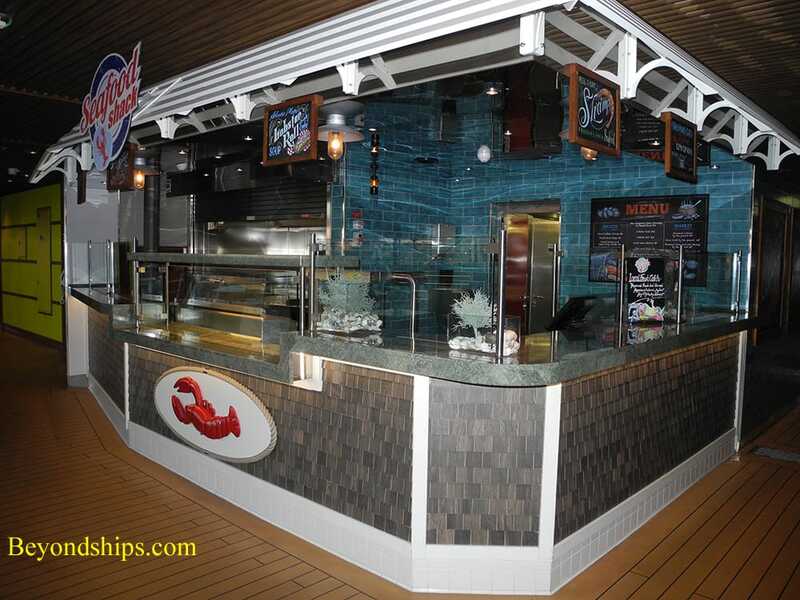 Below: Nearby is the Seafood Shack, which offers casual seafood such as lobster rolls and chowder. Additional charges apply. 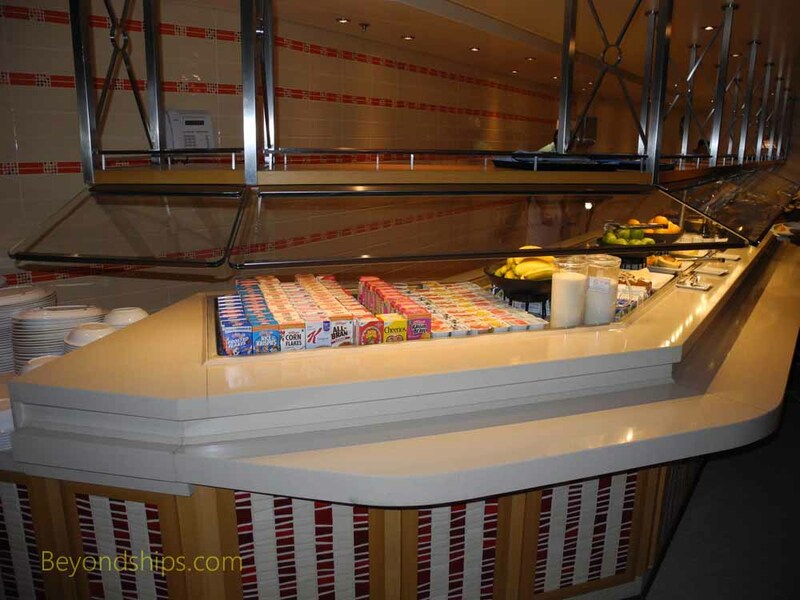 ​Located in the adults-only Serenity area, the Serenity Salad Bar has made-to-order salads. 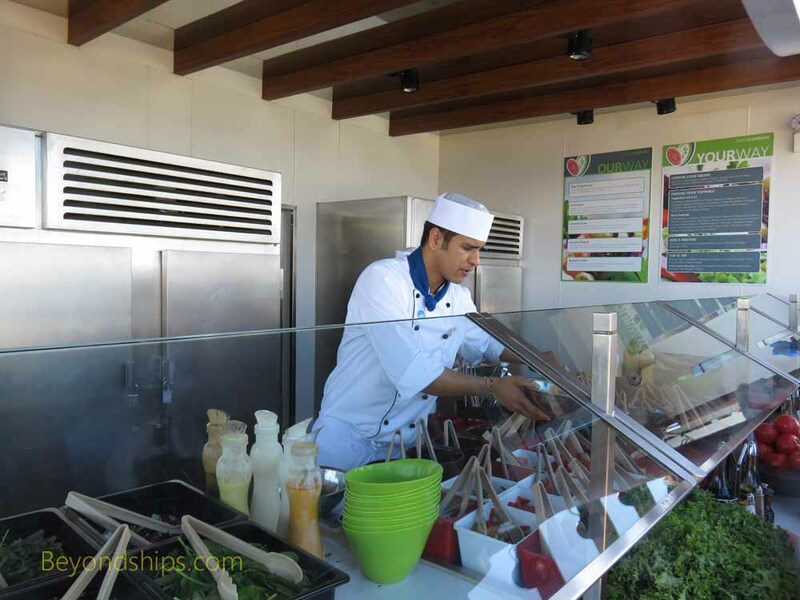 An array of ingredients is laid out on the counter and you tell the staff member which ones you want in your salad. This venue is only open on sea days. Left: ​Cherry on Top is both a sweets shop and an ice cream parlor. 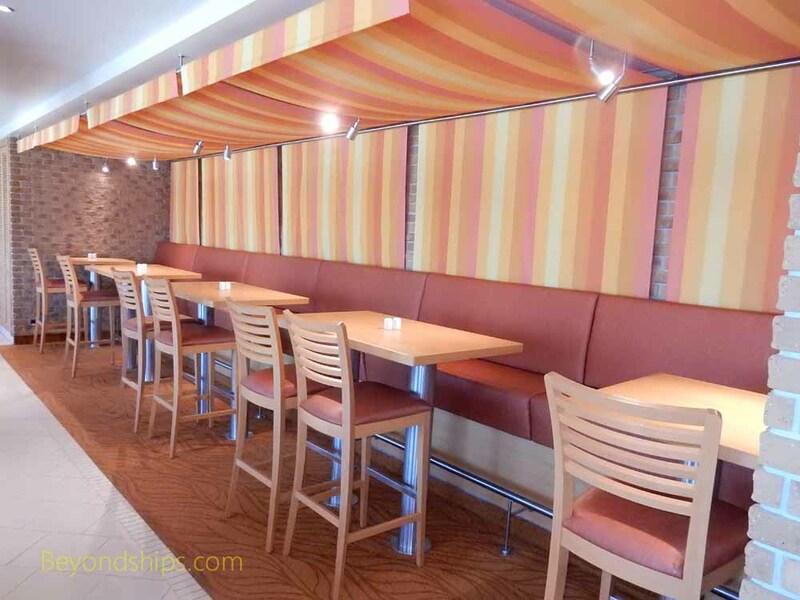 On Vista, this venue has a window opening out onto the Lanai where you can order your ice cream. Once it has been prepared, you can enjoy it at the outdoor tables and chairs. 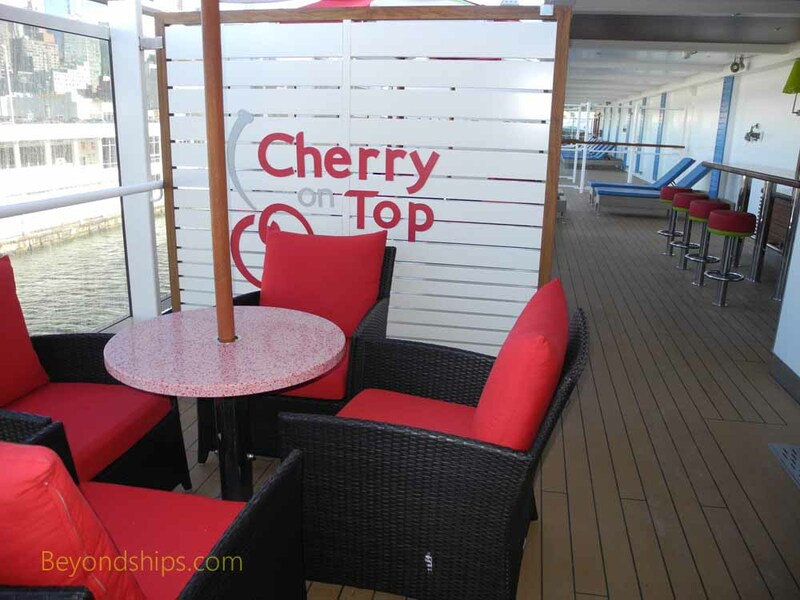 Cherry On Top has additional charges. ​Below left: Java Blue Coffee is Vista's specialty coffee bar. Located by Ocean Plaza, it also offers pastries and cakes. Additional chgarges apply. 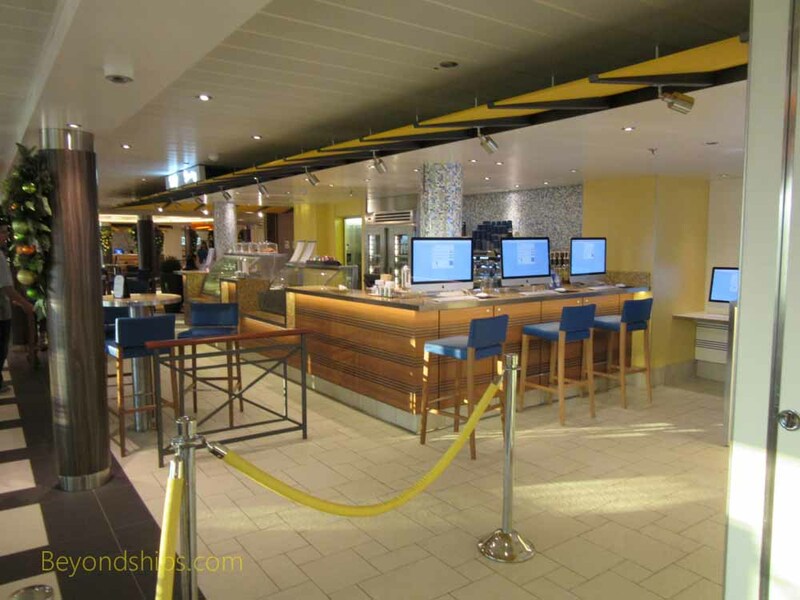 ​Below right: The Taste Bar offers sampler dishes from Carnival's speacilaty restraurants in the evening. At breakfast, this venue is a buffet.